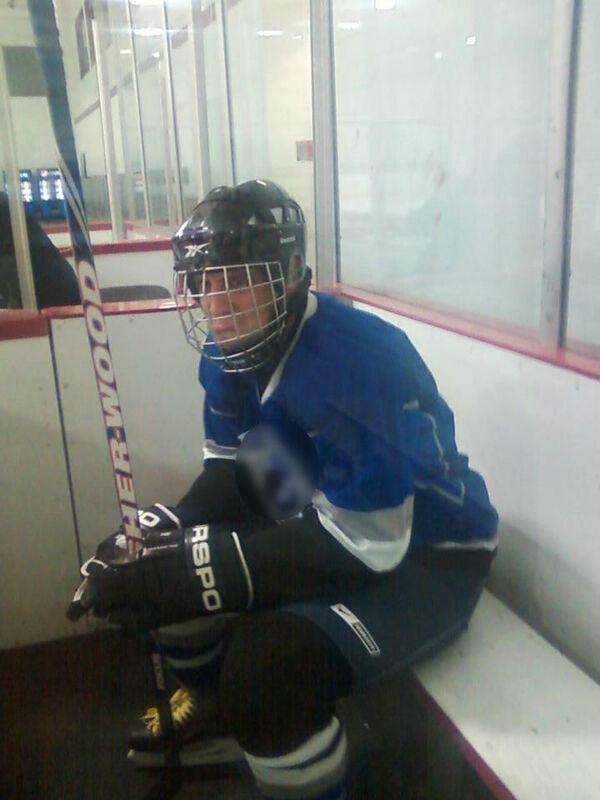 FILE PHOTO: I have spent plenty of time in the penalty box, but thankfully, not last night. Ryan’s spontaneous decision to play hockey a few years ago got me back on skates for the first time in nearly a decade. In the years since, I resumed playing pickup hockey and joined an adult league team — an invitation Veronica actually arranged with the parent of another child in Ryan’s social skills group. I play because it keeps me off the couch a couple of nights a week. I play for the camaraderie. I play because the beer cooler in the center of the locker room is as essential a piece of equipment as the bag of pucks. I play because I enjoy the competition. I play because even a non-checking league provides an outlet for aggression. I play because the locker room bond with the fellas is as appealing in a midnight men’s D-league game as it is in the NHL. We have 20-somethings and 50-somethings. Type-A overachievers and Gen-X slackers. College kids and dads headed for middle age. And yet, in the context of a hockey dressing room, it works. It’s enjoyable enough to make the occasional injuries — I’m averaging about one set of X-rays a year — and the brutally late Sunday-night starts worth it. Last night was actually a reasonable start time — 10:10 p.m. We were facing a team with which we’ve had some heated battles the last few months. One recent game even resulted in a few dropped gloves (between 20-somethings), exchanged punches, and suspensions issued. I avoid such hostilities, but I’m not above sticking my nose, or my shoulder, into the occasional scrum. I almost never score, so about the only place you will find my name on the stat sheet is in the penalty minutes column. Early in last night’s game, there was a battle for the puck in the corner away from me. My defensive partner emerged from the corner with the puck, and found himself the recipient of a pretty healthy slash from his opponent. The last time we played this team, the game got quite heated late, and it looked like this one was headed in the same direction. I decided I might join the fray. As the slasher turned away from the scrum, I had him perfectly lined up, and thought I might deliver a shoulder to the chest just to acknowledge that I had seen the slash. Nothing severe, just a little message that two can play at that game. Right as I headed his way with somewhat malicious intent, I looked at my opponent and recognized the rather distinct face of … Ryan’s hockey coach. The coach did not recognize me. I was on my best behavior the rest of the game. We caught up in the handshake line, and I told him how I had thought better of taking a penalty when I realized who he was. He laughed, and then we talked a bit about how things had been incident-free for Ryan at the most recent practice and game. So far, the response has been exactly what we hoped. The situation will continue to be monitored closely. Ryan’s fragile self-confidence is hopefully on the road to recovery. He had a game yesterday, too, and he played well even though the team lost. His old coach came by just to watch him and gave him a pep talk after the game. When he emerged from the locker room, Ryan saw there was public skating on the ice next, and asked if he could stay. So, he’s showing no signs of wanting to turn away from being on the ice. As for the new coach, we have one more game against his team. I’ll try my best to stay out of the penalty box. I can forgive a slash, and probably a lot more, for the people who would look out for my son. So great that the coaches seem to genuinely be doing what they can to protect Ryan’s experiences on the team. It’s pretty common for adults in these situations- coaches, teachers, etc.- to look the other way, likely because they just don’t know what to do. It’s easier, I guess, to turn a blind eye, let the situation sort itself out. Ryan’s coaches are making a better choice, and I think that will make a huge difference. Also: glad you recognized the guy in time! Phew. Yes, thank heavens for quick facial recognition! I’m very pleased with the response of the coaches. Still have my guard up against it being all talk, but so far there have been no more issues, and Ryan came off the ice with a smile on his face at the last practice and game, so that’s a success.